Whether you’re a fan of crime fiction or you’re mystery writer yourself, you’ll definitely want to plan a visit to the Crime Museum during your next visit to Washington, DC, Founded in 2008 by attorney John Morgan and his friend, John Walsh, known for hosting America’s Most Wanted, the museum provides guests with the opportunity to explore the history of crime and punishment, offers great resources for thriller writers and fans alike, and provide opportunities to learn more about crime scene procedures and investigation techniques in an hands-on environment. 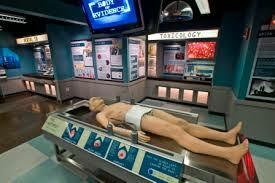 There are a wide variety of permanent exhibits at the Crime Museum that range from fascinating to frightening. With fun exhibits that recreate the eras of Bonnie and Clyde and the Wild West of Jesse James, “A Notorious History of American Crime” follows the evolution of crime from the days of knights through today’s cyberhackers– and includes interactive displays that let guests try their hands at safe cracking and computer hacking. At the “Crime Fighting” exhibit visitors can check out law enforcement gear and see if they have what it takes to serve and protect, while the “Punishment: The Consequence of Crime,” exhibit features a full-scale model police station, complete with a booking room, a police lineup, a jail cell and lie detector tests. Visitors at the Crime Museum can also register to take part in fun hands-on workshops that put forensic techniques, investigation procedures, and crime technologies at your fingertips – literally! Attend “Exploring Forensics” to learn how to lift fingerprints, check alibis, and use evidence to solve a case, or learn exactly what happens to a corpse step-by-step in the “Body Decomposition Workshop.” You can even pretend to be forensic pathologist and examine your own body at the “Autopsy Workshop!” All workshops are taught by real Forensic Scientists, and the ever-changing roster includes scientific and crime-related topics like Arson, Explosives, Fingerprints and Bones. The Crime Museum in Washington, DC is also an excellent resource for writers. Mystery novelists or creators of crime noir will find a comprehensive Crime Library where they can research everything from Artifacts and Cold Cases to Terrorism and War Crimes. Whether you’re trying to make your bomb scene as realistic as possible or you need to know exactly how a protagonist like Jack Davis might fire a weapon, the Crime Library at the Crime Museum has all the answers you need. It also offers real world resources like the Natalee Holloway Resource Center for families of missing persons. With fun activities like the Top Detective Challenge Scavenger Hunt and informative exhibits that will enthrall visitors young and old, the Crime Museum in Washington DC is a must see during your Washington, DC spring break vacation. It brings new meaning to visiting the scene of the crime! Thank you Joel Goldman for all of the many wonderful stories !! !